Faulty Redirects- Is Your SmartPhone Optimized Website Annoying Users? Faulty redirects for Smartphone users happen whenever the users are redirected to the mobile optimized homepage of the website instead of the requested page. This happens because of improper setting of redirects. 1- The browser requests a resource from the server. 2- On detecting that the browser is a smartphone browser, the server responds with the mobile optimized version of the site which is the homepage. 3- This misconfiguration leads to annoyance because the user is presented with a different page other than what he requested. What Exactly is a Faulty Redirect? As per Google, "A faulty redirect is when a desktop page redirects smartphone users to a page on the smartphone-optimized website that is not relevant to their query." In the above figure, 3 different desktop URL's are wrongly redirected to the smartphone optimized home page instead of the corresponding mobile friendly URL's. 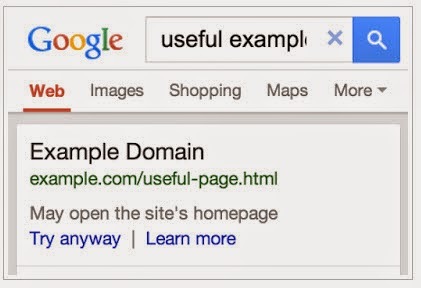 Starting today in all the English search results in the US, whenever Google detects that smartphone users are wrongly redirected to the mobile optimized homepage instead of the the page the user has requested, it will display the caption "May open the site's homepage" along with 2 hyperlinks "Try Anyway" and "Learn More". How to Make Your Site FREE of Faulty Redirects? 1- Check the behavior of your site on a Smartphone. 2- Check out the "Smartphone Crawl Error" section of GWT. 3- Set up your server so that it properly redirects smartphone users to the equivalent URL on your smartphone site. 4- For best results, use responsive design.